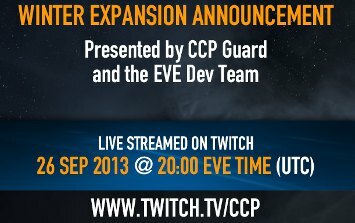 Watch CCP Guard and the EVE development team live on twitch.tv at 20:00 UTC on September 26, 2013, and discover details about our next free expansion coming this Winter 2013! The highly anticipated Alliance Tournament XI with 64 teams fighting for eternal glory and great prizes will begin this weekend on July 20th and 21st at 13:15 UTC and will be continued on July 27/28 and August 3/4. The Alliance Tournament will be broadcasted and commented live by our tournament experts on the CCP Twitch.tv channel, the broadcast starts on July 20th at 13:15 UTC. The GM Team would like to make it known that due to events that will be occurring in the system of Luminaire over the weekend, ships or capsules destroyed between downtime on Friday, March 22nd (11:00 UTC on 22/03/2013), and Downtime on Saturday March 23rd (11:00 UTC on 23/03/2013) will not be eligible for reimbursement.